Lincoln's new concept car shares a mustache with the man who assassinated President Abraham Lincoln. Awkward. Kind of ironic that Abe Lincoln had a beard and no mustache, unlike the 2013 Lincoln MKZ Concept. The show-car's split grille wraps around around its fascia like a dastardly villain's facial hair, sans wax. We've got this clear view of the yet-to-be-officially-revealed show-car Lincoln, thanks to the same bunch of apparent Czech velvet revolutionaries who've been breaking every other embargo during this year's Detroit auto show. 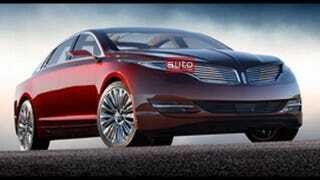 The MKZ will again be Lincoln's version of the 2013 Ford Fusion, which looks far less like an infamous, history-changing assassin.